The Jorge Cantu/Chris Davis platoon lasted zero days, as Davis was sent packing to Oklahoma City right after the trade with the Marlins. Chris Davis is stuck. He has nothing to prove in Triple A, but hasn't been able to do anything during his big league at bats. He's dangerously close to getting tagged with the dreaded Quadruple A label. It's sad, but it happens every year. Prospects become minor league veterans. Sometimes, players shake the tag and succeed as late bloomers. Jack Cust is a recent success story, as a player who had been given up on more than once. After hitting 1 Homerun for the Rockies in 2002, 4 HR's for the Orioles in 2003, and 200 Minor League Homeruns for various organizations, Jack Cust hit 26, 33, and 25 Homeruns for the Oakland A's in 2007, '08, and '09. Jack Cust was 28 years old when he took advantage of his opportunity in 2007. Which brings us to the story of a young ballplayer who many believe is wasting his talents on Triple A fields for the Omaha Royals. The Scott Podsenik to Los Angeles trade may have opened up an everyday spot in the lineup for the Big Walking Hawaiian. 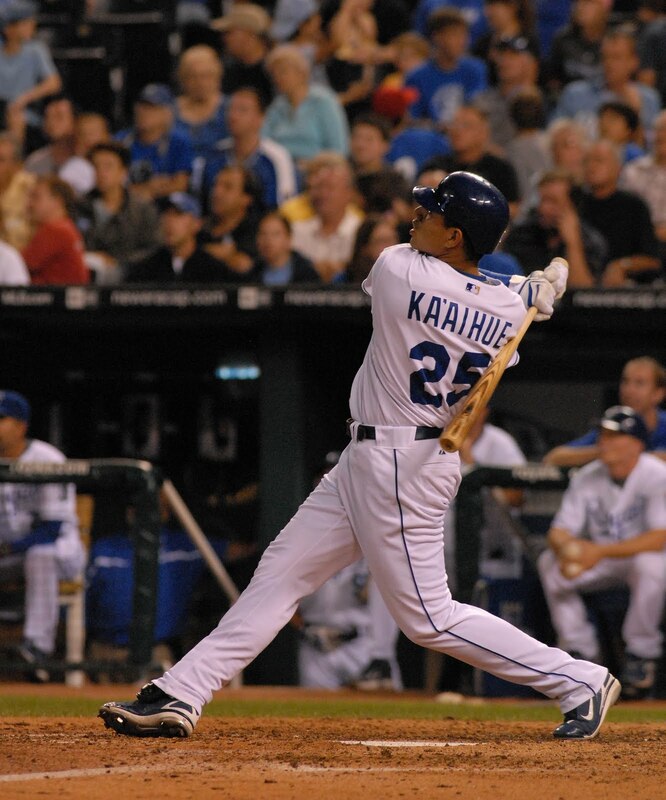 Kila Ka'aihue turned 26 years old during Spring Training this season. That is the prime age for hitters these days. He has compiled hall of fame minor league numbers, if there can be such a thing. 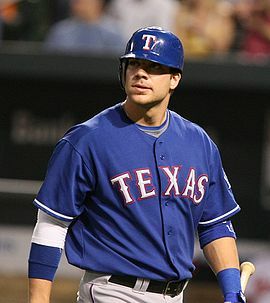 In 2008, he triple slashed across two levels AA/AAA .314/.456/.628, with 37 Homeruns in 124 games. He followed that with a .252/.392/.433 in is first full season in Triple A. After a good spring training this year, he didn't make the big league club. His performance at Omaha has been a dominant .319/.462/.593, with 23 HR's. Since the start of the 2008 season, Kila Ka'aihue's strikeout to walk ration has been a stupendous to 220 K's to 292 BB's. Kila's ability to control the strike zone makes him a good bet to be a solid Major League hitter. His negatives are a lack of speed & raw power and an apparent inability to catch a moving baseball. If you're like me, and you had Chris Davis on your fantasy team (again), you'll want to find a replacement. It will not be hard to find someone who'll be able to outperform Davis, as he was one of the worst hitters in the American League. Personally, I'd look at picking up Domonic Brown or Logan Morrison first. If they're gone, and your league uses OBP, then I'd definitely keep an eye out for a report that the Kansas City called up Kila Ka'aihue. 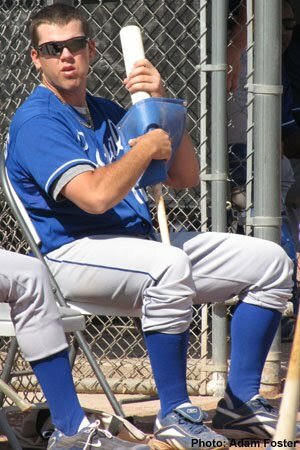 If Kila won't get a shot from KC, then make sure to take a look at Mike Moustakas. He's only 21 years old, and he batted .347, with a 1.100 OPS, and 21 HR's in just 66 Double-A games. As could be expected of a 21-year old, he has not dominated Triple-A pitching since being called up to Omaha a few weeks ago. If Dayton Moore's process doesn't get in the way, the Royals have a bright future in the perennially winnable AL Central. We were serious about that Royals bandwagon in 2013.